Amid all the research and new uses information being presented at the Corn Utilization and Technology Conference a very important announcement was made. 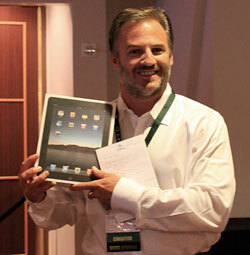 Colin Crankshaw, GEA Barr-Rosin, was the winner of the iPad drawing. As I understand it he was also the first person to register for CUTC. This drawing was for “early registrants” and I don’t think you can get any earlier than that! So congratulations Coin and I hope you enjoy that bad boy. This won’t be the only iPad that CUTC is giving away. The first place winner of the Poster Contest will also win an iPad.